These non-traditional office space perks include showers, lockers, bike racks and outdoor common areas – promoting a greater work life balance and a healthy lifestyle. JLL’s Office Leasing Manager Christopher Selman said he had recently secured five new tenants for Abacus Property Group at 309 George Street from tenants seeking these unique office spaces. “We’ve seen a lot of activity in the sub-200 square metre space in the Sydney CBD during 2014 to date, including the latest deals,” said Mr Selman. The most recent groups to take up tenancies in the building are BW Penman, occupying 180 square metres of space, and Korean Air Lines Co Ltd, occupying 130 square metres. Both have taken five year leases. GMC Software Technology, occupying 116 square metres, and British Airways, occupying 150 square metres, have taken up three year leases. Career Trackers are the most recent to call the new address home, occupying 102 square metres and taking a five year lease. 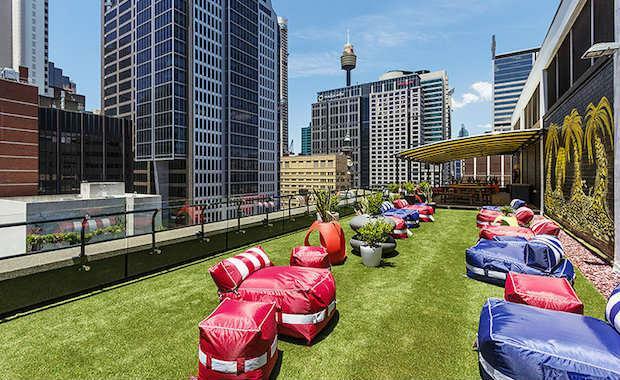 “Tenants are attracted to the funky outdoor common area at 309 George Street, which provides a space for staff to meet, socialise and get together on a Friday night after work,” Mr Selman said. “It’s this unique element that not a lot of other properties provide which appealed to aspiring youthful companies, who are looking to attract and retain the best staff. The building had previously been solely occupied by the Commonwealth bank but since its refurbishment, an opportunity to lease out these floors has been possible. Located on the western side of George Street, the office tower contains more than 9,000 square metres of floor space spread of 15 floors. JLL's Sydney office leasing executive Sean Hennessy said leasing deals at another key CBD address, 8 Spring Street, proved as another example of small business driving activity in the Sydney CBD market. “Currently in the Sydney CBD, we’re seeing a lot of small businesses moving out of smaller offices or serviced office space, looking for short-term three-year leases. Landlords are happy to offer these leases to cater for small business demand in the current market and there is also the opportunity for these businesses to renew their leases in future, potentially making it a six-to eight-year term," Mr Hennessy said. “Some owners are looking at splitting floors, which is a good tactic in the current competitive market to appeal to a wider range of tenants. "Recent deals negotiated by JLL resulted in Alfasi Street Constructions occupying 191.5 square metres and Bravehearts Inc occupying 163.7 square metres. “The office at 8 Spring Street features the flexibility of a “turnkey” solution – also known as pre-existing fit outs –ideal for small businesses or those needing short-term space," Mr Hennessy said. “Businesses looking for short-term space require shorter lead times for moving in, and small businesses benefit from the same convenience. It’s likely we’ll see more of this project-space activity as the strength of business confidence returns to the market."